Holographic glitter highlights over teal imprint custom ornament. 02 of 20. This is a super combination to create a truly unique and special effect custom Christmas bulb : Teal ink is used first and them parts of the image are highlighted with holographic glitter. This ornament really shimmers and sparkles and it is a sure keepsake to those who were lucky to receive one. This is called 2 color pad print custom ornament. To cost this design check out our SPECIALS! 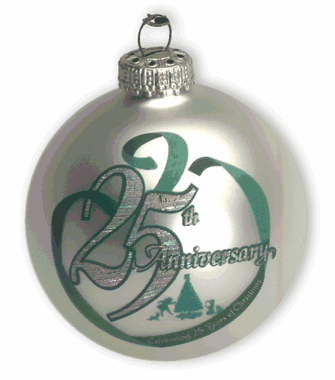 MINIMUM QUANTITY IS 144 ORNAMENTS in this product line, regular price would be $5.25 for 2-5/8 printed ornament and $6.25 for our 3-1/4 ornament as this is a 2 color print.